Radiation has always been a natural part of the world’s environment as a form of energy transmitted through the air. We are exposed to “background” radiation from the sun, stones, soil, and therefore even from our food chain. Man made sources such as mobile phones, televisions and combustible fuels have long been entrenched in our lifestyles. Without radiation, life as we know it would not be possible. The largest man made source of radiation in industrialised countries is medical radiation, which has brought us extraordinary benefits. Since the X-Ray was discovered in 1895, we have extended our radiology repertoire enormously, now encompassing molecular imaging and nuclear medicine. Radiology systems now place significant weight on preventative care and positive patient outcomes, as well as preliminary diagnostics. With our increased knowledge has to come increasing responsibility. It is accepted that large doses of “ionised” radiation (high energy protons with penetrative power found in radiology) can have harmful consequences. With this in mind, Blackrock Clinic sets itself an ongoing objective to lower patient radiation doses. We constantly record levels across all our modalities and the year end allows us to measure our figures. Diagnostic Reference Level (DRL) comparison is the way we gauge our performance. We can evaluate our medical exposure results against a national benchmark. 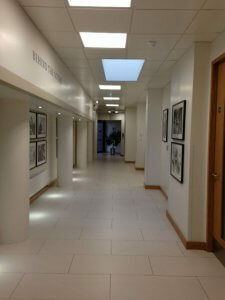 Blackrock Clinic Radiology Department is a centre of our medical community and most patients will encounter it at some stage in their journey through our hospital. 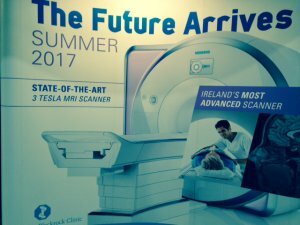 During 2016, Blackrock Clinic’s Board invested over €10m in new radiology facilities and equipment. 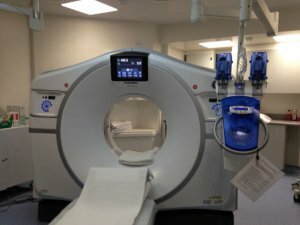 A new GTI/HD Revolution CT scanner. New reconstruction techniques provide 128 slice imaging against the traditional 64 slice. The new “Smart Dose” technology produces high-quality images using substantially lower doses of radiation, thus lowering the patient exposure. A new General X Ray Unit. New wireless imaging technology allows for rapid image processing and instant display. This reduces the time of the examination. A new Catheterisation Laboratory (Cath Lab). Investing in the latest interventional suites offers us the capability to perform more minimally invasive procedures compared to alternatives such as surgery. The imminent installation of a new 3Tesla MRI scanner. This technology brings twice the strength of the traditional magnetic field, yielding exceptional anatomic detail during shorter scan times. Patient comfort is maximised without compromising on quality. A replacement RIS/CIS/ PACS System. This is a state of the art picture archiving and communications system (PACS), coupled with clinical information (CIS) and radiology information (RIS) systems. The latest digital technology links images with clinical and database elements. It will provide the end user with faster and more efficient access to information across all systems within our delivery network. Our continued investment in Radiology modalities is essential in helping us to improve patient safety. It takes careful planning to balance departmental growth with a continuous improvement of environmental and patient safety. Our radiation level management is a prime example of this awareness in practice. As we enter 2017, we are able to look back on 2016 and show how effective our efforts have been. 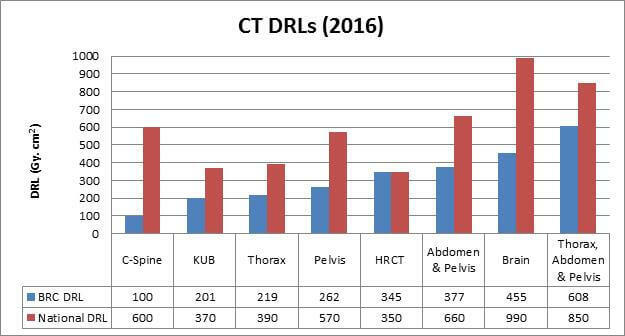 Looking at X- ray and CT DRL figures for 2016, Blackrock Clinic compares very well with the national benchmark across both modalities. CT Cervical Spine, for instance, falls 83.33% below the National DRL, whilst General X-ray Cervical Spine achieved a comparative reduction of 68.18%. As we are creating safer, more effective services for patients, we are building a stellar team of experts in Specialist Imaging, Diagnostic and Interventional Services. This expertise creates its own demand and we are seeing a sharp rise in referrals into the department. With quicker diagnosis and better patient outcomes, the department has high expectations for 2017. This success story would not have been possible without our dedicated staff. Our Radiology Services Manager Bernard Bonroy considers Blackrock Clinic to have built “one of the best radiology departments in the country”.